Enjoy all of the necessary amenities and more on board Celebrity Reflection for the perfect family cruise! Celebrity Reflection is in Celebrity’s Solstice class of ships along with the Eclipse, Equinox, Silhouette and Solstice. Celebrity Reflection sails to the Caribbean, the Atlantic and Europe. There are plenty of activities on the ship. In the Reflection’s Theatre, you can enjoy the best performance from many great Broadway style shows. In the afternoon, take a refreshing dip in the Solarium Pool or challenge your friends and family to a game of basketball. There is always something to do onboard. For children, there is also plenty to do. Bring them to the cozy Fun Factory Youth Center or the Xclub Teen Center where they can socialise with peers and participate in activities. You will lack for nothing on board the Celebrity Reflection. 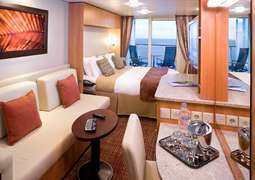 Thanks to the great selection of cabins aboard this luxury liner, you are guaranteed to find the best accommodations to meet your needs. 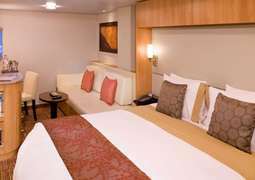 Each cabin is stylishly and elegantly furnished to make your cruise as relaxed and as comfortable as possible. Guests can find a wide array of cabin categories on board to reflect every need and budget. 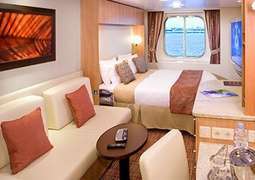 Staterooms range from inside cabins with all of the necessary amenities to Suites which offer luxuries such as a European-style butler service. When it comes to cuisine, prepare to be pampered on the highest levels. Fresh, exquisite and lovingly prepared dishes are served in the nine specialty restaurants, where the friendly personnel are always happy to help.Assist a celebrity cef on the grill at the Lawn Club Grill or visit Qsine an innovative dining experience which promises to offer passengers a culinary experience like no other, on land or sea. Later you can visit Michael's Club to relax in a comfortable atmosphere while enjoying a range of cocktails, canapés and more. There is a varied selection of entertainment opportunities on board Celebrity Reflection. Check out the spectacular Hot Glass Show in the evening, followed by a visit to the exclusive nightclub. Of course, you could also spend the evening hours trying your luck in the casino or taking in a fantastic live show at the theatre. When looking for a quiet getaway, you're welcome to retreat to 'The Hideaway'-- an ideal place for reading, listening to music and simply relaxing. The Celebrity Reflection offers a great selection of activities, one of the biggest highlights of which is the Lawn Club. Here you can play a round of croquet or boccia on the well-tended English lawn. The so-called „Alcoves“, roofed wicker beach pods, provide quiet getaways for 2 to 4 persons each. Use the newest Apple products in the Celebrity iLounge to communicate with friends and family at home, or relax with music or a good book. A card room and library can also be found on board. Take advantage of the diverse wellness and sports offerings on board the Celebrity Reflection. In addition to a basketball court and athletic track, you will also find a fitness center equipped with state-of-the-art exercise machines. Let yourself be pampered with different wellness programmes in the "AquaSpa" AquaSpa, refresh yourself with a dip in one of the three pools, or take it easy relaxing on the comfortable sitting and lounging furniture on the spacious sundeck. For a journey on the Celebrity Century casual and sportive clothing is recommended during the day, whereas elegant evening wear is recommended for the evenings. However, all who prefer to dine more casually in the evening are more than welcome to do so in the laid-back atmosphere of a self-serve restaurant. All persons under the age of 18 are considered minors when travelling with Princess cruises. Both minors and young adults (between the ages of 18 and 21) are required to travel with an adult supervisor. The Celebrity Reflection is the latest addition to the Solstice class of ships. Measuring an incredible 1047 feet from bow to stern, this ship’s incredible scale makes it one of the most sensational cruise-liners in operation today. With a capacity of over 2,800, the Celebrity Reflection manages to reproduce all of the luxury and opulence that make the Solstice class of liners the envy of the seas. 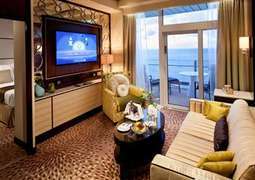 This is a ship that simply exudes class, and its three grades of suite mean passengers will not be disappointed in their search for luxurious cruising. The summer months in Europe will see the Celebrity Reflection visit several Mediterranean destinations. However, passengers will have the chance to escape the harsh European winter with a cruise to the Caribbean during the winter months. Thanks to CruiseAway, a once-in-a-lifetime trip on this stunning vessel will not break the bank. Your dream cruise on one of the world’s most prestigious ships is in good hands with us. The Celebrity Reflection boasts a number of sensational accommodation options, so passengers should expect a luxurious and decadent experience aboard this beautiful vessel. The unique spa-inspired deck features 34 exclusive Aqua Class suites. Passengers who choose to book this option should expect a very special service. Access to the Persian Garden and VIP treatment at the ship’s exclusive restaurant, Blu, will give Aqua Class passengers a real taste of opulent living. The ship’s Signature Suites feature Celebrity’s own Reverie Dream Sleep System, and passengers will wake up to jaw-dropping views through panoramic windows and doors. However, it is the ship’s Reflection Suite that will be the talk of the ocean waves. These two-bedroom suites come with personal service from a butler and a stunning glass-enclosed rain shower. A team of classically trained chefs are just waiting to cater to the high expectations of the Reflection’s passengers. Dining on the ship is a major part of the cruising experience, and no expense has been spared in giving passengers the very best in culinary creations. The Lawn Club Grill is the perfect location for a tasty lunch while taking in the fresh sea air. Quick bites and scrumptious snacks are always available at The Porch, and The Alcoves provide a more private dining experience under the shade of beautiful cabanas. However, the wow-factor is most evident at Qsine. Featuring menus and wine lists on individual iPads, Qsine offers a dining experience that simply oozes theatricality; the restaurant’s tableside lobster presentation is the stuff of legends! What Makes the Celebrity Reflection So Special? Quite simply, the Celebrity Reflection is a floating five-star hotel. With regular entertainment and a wide range of learning activities designed around individual iPads, this ship is full of surprises. The ‘Celebrity Life’ programme of entertainment and learning will ensure that passengers are given the richest experience possible aboard the Celebrity Reflection, and CruiseAway is ready to make this dream become a reality for its customers. Let CruiseAway arrange the trip of a lifetime on the stunning Celebrity Reflection, and the cost might just surprise you.